Acqua Alta bookshop is probably the most famous bookshop in Venice. The name means High Water. It naturally refers to the high tides in Venice. And it is not just a picturesque name. But a rightful name. Why? Well, that bookshop is periodically frequented by an exceptional visitor, none other than water! Which is not a perfect match for books, I dare say. So, in order to overcome the problem, the owner installed inside the library, other than regular bookshelves, the most peculiar book-containers you could imagine: a couple of bathtubs, a canoe, a boat and an entire gondola. I could write an enthusiastic post, poetically describing the charm and the unique allure of this place, without actually telling anything personal. And it would be like a hundred posts already written about Libreria Acqua Alta. But I won’t. First of all, because I wouldn’t be able to do so in English. But, to be honest, I wouldn’t do that even if I wrote in my mother tongue, Italian. I like poetry, but I am no poet. Plus, when I read posts and articles online about a tourist attraction, a restaurant, a hotel, I don’t want to read verses. I prefer to read sincere and genuine words. A description of the atmosphere of the place is surely appreciated, but then… tell me what you saw, what you think, what you experienced, an preferably be bright, witty and sharp otherwise I better buy a tourists guide. So now follows my own experience. The first thing that hit me when I visited the Libreria Acqua Alta the first time was his owner Luigi, who opened the place in 2004. He was sitting just past the entrance on the left, behind the cash register. Jovial, plump and serene, he was addressing each new customer who entered the shop with a different greeting. To me he decided to spoke in French: “Bonjour!”. Last time I went there with my nephew Filippo. And il signor Luigi this time really wanted for the customers to pay attention to a silly optical illusion image. It was nothing special, really. But he repeated to every person coming in: “Look at this, isn’t it great? It gives you the impression it is following you”. Oooo-kaaay. 😀 He is a character. The shop has a lot of books, clearly. But if you expect them to be all well ordered, well lit, well preserved as in regular bookshops, you’re wrong. These books, some new, some old, in Italian or in other languages, seem to have taken control over the place. They are everywhere. 🙂 Along with other knick-knacks here and there. It is all very suggestive, even though I would prefer not to see those two dummies on the gondola. They are simply disturbing. The impression I had while in the Libreria Acqua Alta was like to be in a grandpa old basement, where you can see objects of an entire life, useful and useless, collected along the years. A place a bit dark, a bit fuggy, and so jam-packed that you can barely move. But a place full of memories as well. And, being that so, it has its charm. Books here are everywhere possible. Some of them, old and unwanted, became objects of décor or part of the furniture, like the steps of a unique and colourful staircase leading to admire the view of a canal. Right there, in the wall, you can see the writing: “wonderful view”. But, honestly, it is a view like many others in Venice. The wonderful thing to admire here is the staircase itself. If you go, be sure to explore the entire Acqua Alta bookshop: the open door leading to the canal, funnily defined Fire Exit, and the little quaint rear courtyard. I read many opinions online about this famous bookshop in Venice. Some people were disappointed by the place, mainly because books are not treated “with the due respect”. Well, there’s a truth in this. In fact, I do not see this place as a bookshop. I consider it an attraction of Venice. A place to see. Also probably a must see, if you – like me – are one of those persons that don’t want to simply visit 2 churches and 3 museums while travelling. But you also want to taste the local dishes, melt with the inhabitants, buy something made by a local artisan like PlumPlumCreations and also see “that quaint little shop that everyone is talking about”. Welcome to the most beautiful bookshop in the world. 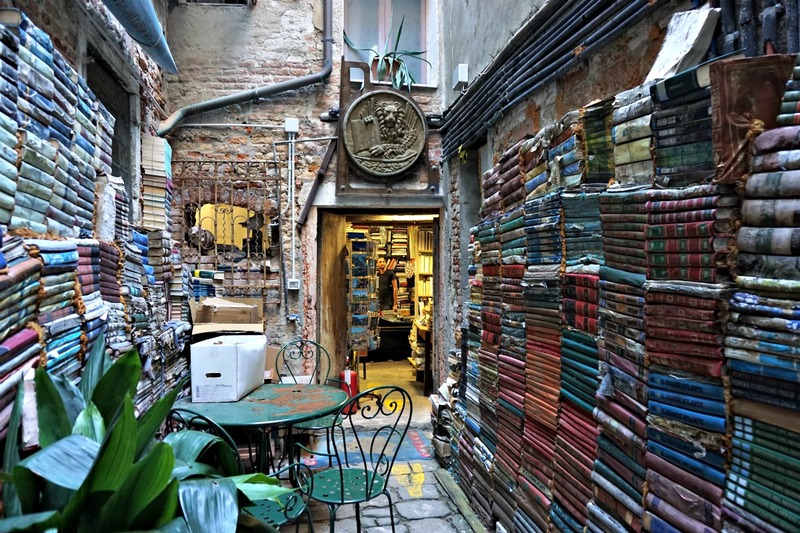 Did you get a chance to visit Acqua Alta bookshop while in Venice? How did you like it?